Sub: KGBV, APSSA, Hyderabad - Extension of POLYCET coachi'ng camp -Orientation training programme for Special Officers and Accountants of the KGBVs - Reg. In the reference cited, the Project Officer, APSSA, Ananthapuram has requested to extend the POLYCET coaching camp up 28-05-2015, so as to take the students directly to the POLYCET examination centers without sending them to their homes. After careful examination, the State Project Director is pleased to extend the POLYCET coaching camp up to 28-05-2015. 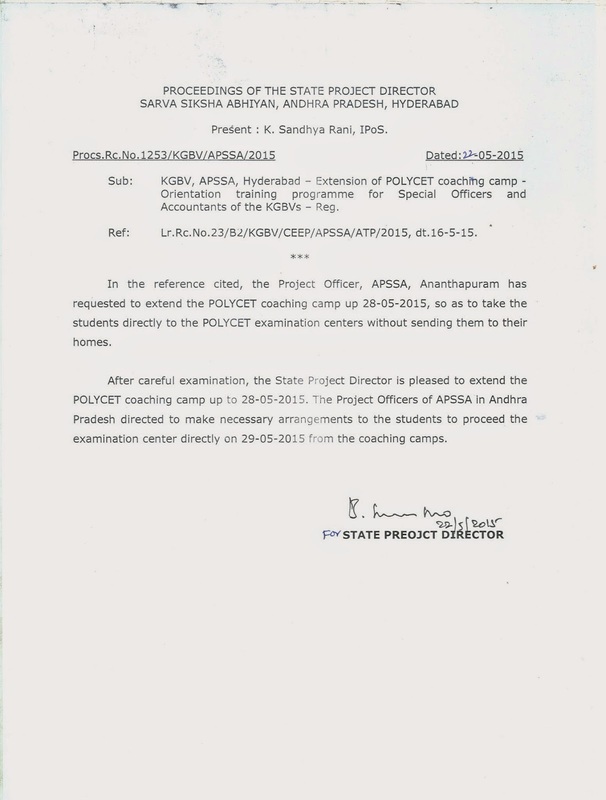 The Project Officers of APSSA in Andhra Pradesh directed to make necessary arrangements to the students to proceed the examination center directly on 29-05-2015 from the coaching camps.